Over the years there have been some tough times along with some great times. Those tough times + great times have led to many lessons learned to include some money lessons. In today’s episode I share 9 of these lessons. They are my reflections, my thoughts, my perspective with the hopes it may be of value to you. Get out of your own way, know you're worth it. What may be small to you can be huge for someone else. You are the captain of your ship, the director of your movie, the author of your book. YES, I Want To Know When The Next Class Is! I’d love to hear from you! What money lessons have you learned over the years? Please be sure to share in the comments section below :-). 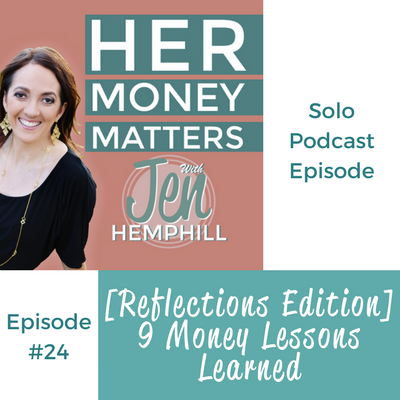 [00:00:28] JH: Hey you, this is Jen Hemphill. Welcome to yet another episode! I've got some good stuff for you today, or at least I think it is good stuff. I really hope that you enjoy it, and I am not going to really give you advice, but rather I'm just going to share with you some of my thoughts, some of my reflections of just some money lessons that I have learned over the years and hopefully it is of help and of value to you. So I'm going to share withe you nine lessons, a total of nine lessons that include from why I learned to not completely upgrade the lifestyle when there's an increase in income. I've also learned how you don't have to follow financial expert's advice to the T and what I mean by that. I'm also going to share with you a little bit why it's okay, why I learned it's okay not to coupon and of course there's six others ones that I'm going to share, but I wanted to just give you an inside scoop or inside peak as to what we're going to talk about. And before I get into that, I wanted to share with you I think what I consider great news. I created about a little over a year ago what I call my "Money and Time Saving Cheat Sheet", which I provide just basically if you go to my website it is literally clear, just front and center where you can see it as just my main freebie that I offer people that come to my website. So I've created this and I also ask for some feedback just to make sure it's helpful, it's clear, if maybe there was something that was missing? Those types of things. Because a cheat sheet is pretty in depth. It's not long as in 40 pages, but in depth in the sense of that you're not going to sit there and fill it out. You're not going to be able to complete this just in five-10 minutes. It's something that you're going to take some time in thinking through and working through it. So it is simplified, but at the same time it's in depth. So I forget to just really check the survey answers. I don't get the notifications so I just naturally forget and I realized recently that I hadn't checked them in a while. So I was really in awe of the kind words. I don't have any times to give a shout-out to but for those who have filled out that survey I really, really wanna thank you cause all your feedback, I take it seriously, constructive, kind words, whether maybe you didn't like it, those type of things. So I wanted to share with you some of the feedback that I got, not to toot my own horn but to show you that this resource is, one, it's out there for you and two, that people have had success, that others have found valuable. So in case that is something that is of interest to you, I'll share with you at the end of the episode how you can get your hands on that, even though I already told you it's front and center on my website! So let me go ahead and read some of the feedback that I got on this money and time saving cheat sheet. So one was that she was hoping for something else, but yet learning about mindsets was huge and definitely an area that she is working to improve. Another person talked about how "the cheat sheet has helped me get my act together. I appreciate your work, really great!" And then another person said, she didn't know where the improvement was needed but she felt that, it says, "I think you've created an invaluable resource and definitely recommend it to any friends needing some direction." So again I wanted to share that with you, not to toot my own horn even though those words are awesome and mean a lot to me, but to share with you that one, this resource is available, it's free, it's out there for you. And that people have had — have found it valuable. My goodness I think I added another word in there! Now let's go ahead and get to the lessons today. So again they are nine lessons that I have learned over the years and I'm going to just share with you some thoughts, some reflections as well on them. So lesson number one is to never fully upgrade your living with pay increases. That is something that we have found ourselves doing. So my husband, let's say he gets and increase, a promotion, and increase in income and somehow we find ourselves all of a sudden living on that income, versus living on the income we were living on before and we were living comfortably. So there's nothing wrong with treating yourself, especially if there's a promotion, if there's an increase in income, but don't upgrade completely. Especially when you have other goals that you wanna achieve. Now I've made, or we've made — I shouldn't say "I" cause we're a team. But we've made this mistake, I would say three times in the course of our marriage. Now we are no longer making this mistake, fortunately. So that is a lesson number one, just to never fully upgrade your living with pay increases, just to continue living on your previous income especially if you were living comfortably and your needs were met, and just use the extra money on the other financial goals that you are trying to achieve. Lesson number two is to get over the guilt for the things you want. You have to get out of your own way, you have to know you're worth it. I'm really, it's a daily struggle at times. I'm still working on this cause there are some times when I have no problems splurging on me, whether I go get my nails done or things like that, but other times I do have the guilt. Because as women, as we know we're the nurturers, so we want to take care of others before we take care of ourselves. So that's where the guilt comes in. If I wanna do something for me I think, "Well maybe I should use this money for the kids instead," or other items or other things that come to mind. But having said that, you do have to differentiate what I have found is in the guilt of spending on yourself versus the guilt of knowing you were going to go over what was intended for in your money plan. So yes, get over the guilt for the things you want. You do have to get out of your own way, but you definitely have to differentiate between the guilt of spending for yourself versus the guilt of knowing that you shouldn't really be spending that money because the money isn't there or because it's not within your budgeted amount. Lesson number three is that really money experts don't know everything and you don't have to follow there advice to the T. I've learned this over the years because I personally have followed their advice to the T and have gotten some results, but I still felt like I was getting nowhere. And I realized, one, they don't really know our wants and desires. They're not sitting there in front of you, having those conversations about what your personal needs are, what your wants are, where you wanna be, right? So they really don't know everything. So I gave myself the permission to take what worked, and use it and tweak what I needed and just make it work for us. And that has worked fantastic! This has evolved to what I call a virtual money method that I use, and I actually recently did a class on this and I'd be happy to — it's no longer available but I'd be happy for the next if you want to attend a class and if I offer that again, which I'm sure I will, just I'll be sure to share the link in the show notes as to how you can get notified for the next class. Lesson number four is to not get stuck in the past. You don't wanna get stuck thinking on the money you just lost. Let's say you just lost some money, you spent some money that you weren't supposed to, or maybe you had to tap into the savings that you worked really, really hard to built up and now it's dwindled down and there's nothing there. I got stuck in that. I got stuck thinking in the past. I got stuck thinking of like, "Well we had all this money saved up, and now this happened, and now it's gone!" Life is life, move on, you can make more money and you can definitely save more money. I've learned that and it's okay because it's not the end of the world. After the savings dwindle down, you are still here, right? So the world is still moving on, you also need to move on with it and start saving again. That's all. And you just have to get over it. Lesson number five that I had a hard time with is that you don't have to coupon to save money. You don't have to cut and clip coupons and use that as a method to save money. I definitely feel guilty about that. I use them when I conveniently have them, but I personally do not like looking and clipping coupons, it's just not me. I love it that others do it and save money with it, and that's great. But I realized that if you don't like to clip coupons, it's okay. There's other ways that you can save, and I have found other ways that I can save. So other ways that I have found to save is just making sure all the money is accounted for and getting clear on what we wanted, and what it took to get there. Another way to save was really automating the savings, treating it like a bill. And also just looking at the expenses and seeing where maybe we could spend less on. Lesson number five is really to have fun with your money. Life is not just about working to make that money so you can save that money so you can get out of debt. Yes, you can save, pay off debt, and have fun too. In fact, I think that's so important. 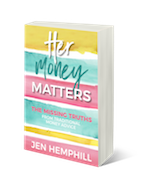 It's possible, you don't want to get stuck in the rut of saying that you can't have fun because you are overwhelmed with the debt or maybe with the bills or things of that sort. If you think it's possible, you're going to find a way. You also have to be clear, what I have found, is what that fun looks like, what it costs, and how that fits into your money plan. That's what I have learned. Lesson number seven is to be giving. Maybe money is tight, but nothing is ever too little in the terms of giving. Something is better than nothing, I have learned that. Those are some wise words from my husband that he has stressed over the years, is something is better than nothing. What may be small to you can be huge to someone else. The feeling that you get from giving is like nothing else and it really helps you. I know it's helped me in creating that sense of abundance and getting rid of that lack mentality. Lesson number eight is a big one. It's to always be aware of those money stories you're telling yourself. This was actually something I didn't know anything about, how it was affecting me, until I met my husband. And he is, and he was, and he still is a free spirit and money wasn't something ever that really worried him so to speak. He basically did what he wanted, and of course within reasoning. But his thought process was that he could always work to make more money. So that's why he didn't worry, because in his mind, "Well I'll just work and make more money, and that's it." I didn't understand this because I always had this deep urgency to save, and I had a lot of guilt, a lot of guilt about spending, which has definitely bettered over the years but it made me really think about why this was? When I saw my husband not worried about the money because in his mind he just had to work more. And then I saw myself and I realized it was this urgency that I had to save, and I had this guilt around money. I started looking back around my childhood and how I grew up, and I realized that there was a lack mentality and a mindset of never having enough money. Cause "we don't have enough money" was something I heard over, and over again. And you may have heard this already if you've heard some of my other podcast episodes, but I realized this affected me by the need of having to save all the time. Which there's definitely nothing wrong with saving and I definitely encourage it, but I was just afraid to spend it because then it could mean that I didn't have enough. So you see what happened right? Because of what I heard and experienced growing up, I was afraid of not having money, which caused me to be put in this cycle of always saving and being afraid, and having guilt around spending. And once I became aware of that, I was able to change things. Granted it's not an overnight fix, this is something that you, honestly, continuously work on on a daily basis just because you grew up around that. It's nothing that's going to go away fully. It's something that you have to work on daily. And the final lesson that I've learned is to keep dreaming. That is something that as adults we don't always do enough of. And for a while I didn't realize, honestly, that I stopped dreaming. Probably because of the struggles my family experienced, the losses, all the financial burdens and struggles. But once I was aware of that "my money story" the background of what was going on and how I grew up around money, I realized I was in charge of my own story. I couldn't let others or my past story take control of my current life cause I was in charge. I was the writer of the story and I wanted to be the author of it. And so that means I was in control and I finally allowed myself to be that and let that happen. And let me tell you, that's a huge help. But of course, you have to make sure that you're aware of how you grew up around money, what you heard, what you saw, what you experienced, all that good stuff. So that is lesson number nine, is to keep dreaming. So those are the lessons that I have learned over the years. I hope this has been helpful to you and of value to you. So I'm going to recap real quick what these lessons were: lesson number one is to never upgrade your living with pay increase, or fully upgrade your living. It's okay to treat yourself, but just use that extra money towards those financial goals. Lesson number two is to get over the guilt for things you want. It's really not worth it at all. Lesson number three, the money experts or the money guru's don't know everything specifically for your needs, and you don't have to follow their advice to the T. Cause guess what? Personal finance is person, it's unique to every person. Lesson number four was to not get stuck in the past. It doesn't do you any good and I always remember that phrase that the present is a gift. Lesson number five is you don't have to clip coupons to save money. There are definitely other ways to save. Lesson number six is to have fun with your money. You're really only on this earth for so long, so enjoy it. Enjoy the ride! Lesson number seven is to be giving. It gives you a sense of abundance, and what you give, even though to you is just a small amount or what you feel is a small amount, that can make such a huge difference to someone else. And lesson number eight is to always be aware of the money stories you're telling yourself. They definitely affect you more than you realize. And number nine, the last lesson that I've learned — I'm sure there's other lessons, but there are the ones that I come up with — is to keep dreaming. because you are definitely the captain of your ship, you are the director of your movie, and the author of your book. So I hope you enjoyed this episode. Let me know, I would love, love to hear from you. Let me know what money lessons you have learned over the years and you can do that by going to today's show notes, and I'll tell you in a little bit where to find that, and comment there and let me know what are your top lessons that you have learned? Because I'd really love to hear from you, I like to engage with you and get to know you. So we are wrapping it up here. If you wanted to get your hands on the Money and Time Saving Cheat Sheet that I mentioned earlier, the way you can do is — if you're not driving — is to text the word, all one word, "Jenscheatsheet". So "Jenscheatsheet", there's no grammar as far as apostrophe. Just "Jenscheatsheet", all together, all one word to 33444. Or just simply, especially for my international listeners, just go to today's show notes, it will be in there. And you can just find it, as I mention, front and center as you go to my website, but it will be in today's show notes under the resources for this particular episode as well. So that is a wrap for today. Thank you so much for taking time out of your busy schedule to tune into the show, today's show. 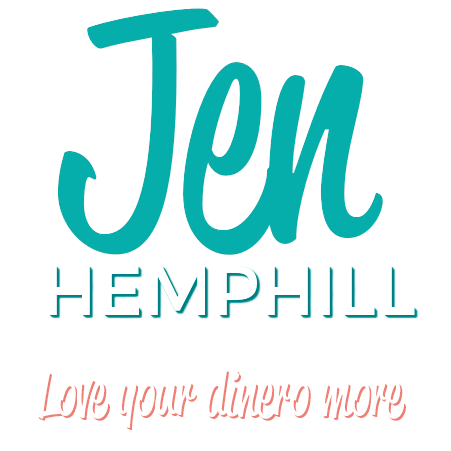 Be sure you can check out the show notes for the links, all that good stuff, at Jenhemphill.com/24. And we will talk again next Thursday.